I am continuing the series on Brother Harrell and his preaching at Bridge City from yesterday. I mentioned how that Brother Harrell had encouraged me to dig into Pilgrim’s Progress and dig out the treasures that were there. He told me that he thought that Pilgrim’s Progress was one of the most neglected books among most Pentecostal preachers. When I really started applying myself toward it, a vast storehouse of material was opened up to me. 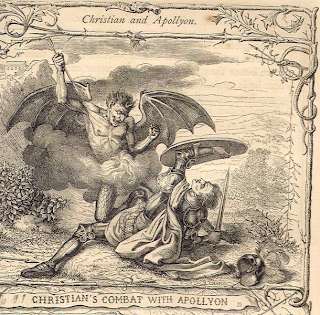 The whole allegory is concerned with Christian getting to the Celestial City (Heaven) and the battles and characters that he encounters along the way. Mr. Facing Both Ways, Worldly Wiseman, Hopeful, Faithful, and the Man in the Iron Cage are just a small few of worthy characters that will work for very good “sermon spice.” Over the years Brother Harrell has preached from multiple angles using the characters in that book. One of the most memorable sermons that I heard him preach was “A Loaf of Bread and a Flagon of Wine.” It just so happens that I was in Bridge City on a Sunday morning when he preached it. 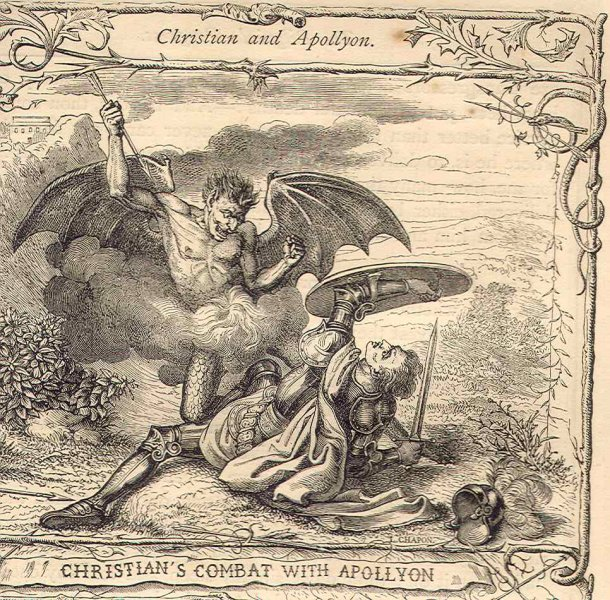 He worked with the portion where Christian descends into the Valley of Humiliation and has a long protracted fight with Apollyon. Bunyan described the fight in a notable way when he said that you have never heard such a battle in all of your life—the clanging of weapons, the shouts of anguish, the cries of pain, and the sheer noise of it all was disconcerting to say the least. Christian almost loses the fight but in the end manages to find his sword and barely escapes with his life. The whole scene is indicative of any man who serves the Lord and his certain battle he will have with the devil. Brother Harrell went to the scene immediately following the fight when Christian reaches in his backpack and finds a loaf of bread and a bottle of wine. It is what the porter’s daughters had placed in his pack prior to him leaving the Palace Beautiful (a symbol of the church). The bread and wine revived Christian and healed his wounds after the battle. Brother Harrell went on to say that there are untold benefits that you get every time you go to the house of worship. 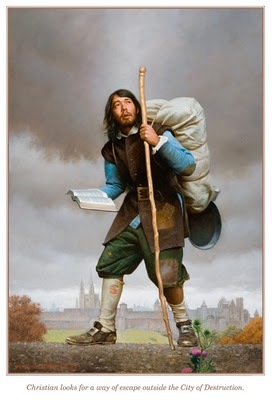 There are things that are put into your spirit that you may not find for months but when you descend into the Valley of Humiliation and have to fight it out with the devil, after the battle, you will reach into your pack and discovery a bit of bread and a flagon of wine that will bring communion with Christ! It was an incredible message that I will never forget! Brother Harrell would also take specific characters and build messages around the characteristics that formed these characters. He preached about Mr. Ready-to-Halt which is one of the characters who seems to get challenged by every situation he faces along the way. Every straw along the way is the one that breaks Mr. Ready-to-Halt’s back. He seems to thrive on discouragement and much of his life is live in the “ain’t it awful club.” When you hear sermons like this it makes you want to do better and get out of the doldrums and man up and do your work. We all encounter difficulties along the way but we must continue to go on. Another character he preached a sermon about was Mr. Fearful. Mr. Fearful had one overarching fear that made him miserable. He was concerned about whether or not it would turn out well for him when he died. He seemed to manage to do well with most of the difficulties of life except for this overriding and unreasonable fear that he was going to be lost in the end. Interestingly when he was in the Palace Beautiful and he was around all of the shields, weapons, and past trophies that were on the walls to commemorate the victories of many in the past, his faith would soar and he knew all was going to be well. However, when he left that room his faith sank like a rock. Brother Harrell would uniquely use these characters to motivate you to get some grit for your craw to make it for another round. He also preached a sermon on the “Three Shining Ones” that Christian met along the way. He met them when the burden of sin was removed from him. The first Shining One tells him after the burden has been removed that his sins have been forgiven. The second Shining One brings him a royal coat to wear during this journey. Up to this point, Christian clothes had been ragged and torn and worthless but they were soon replaced with something far more valuable and worthy to him. The third Shining One came forward and put a mark on the forehead of Christian to show that he was owned by God. Brother Harrell preached two sermons on Vanity Fair when Christian and Faithful are attempting to navigate through it. I am not sure if they still have these available but you would be very well served by these sermons. Vanity is the city and Vanity Fair is the place of commerce in this vile place. It is created by the construction of the devil as he attempts to get every saint along the way to trade spiritual things for the superficial. Vanity has been around for a long time, in fact its origin is from Babylon. 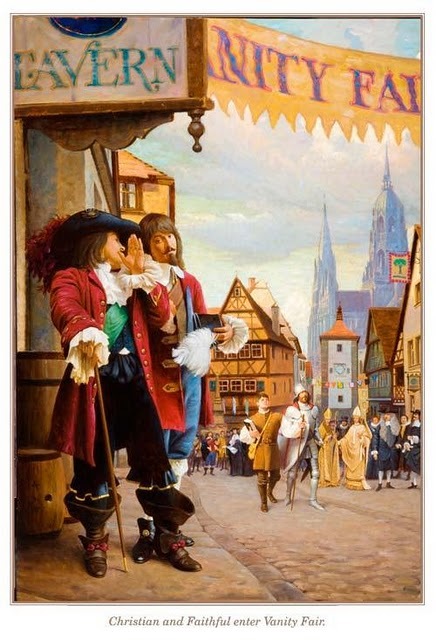 It is populated with cheats, fools, knaves, rogues, and apes who spend their time fooling about with games, thieving, murders, adulteries, and false swearers. These types are the salesmen of the things that are being sold. In reality the merchandise there are nothing more than idols of distraction for the travelers. Brother Harrell did a fantastic job with it! There is much more to the scene at Vanity Fair but you find some unsavory characters there. Men like Judge Lord Hategood, Lord Carnal Delight, Mr. Blindman, Mr. Live-Loose, and many others. As with “A Loaf of Bread and a Flagon of Wine,” he would take scenes out of the book and make them work for him. One such message he preached was entitled “What Faithful Met On the Hill of Difficulty.” The Hill of Difficulty was a huge towering spire that was filled with various obstacles that were meant to hinder the progress of Christian and Faithful along the way. There are multiple other sermon illustrations from Pilgrim’s Progress that Brother Harrell used over the years to weave into his preaching. There is one scene that reminds me of Brother Harrell in so many ways. It is where Christian is approaching the Palace Beautiful at dusk. He looks up the lonely road and discovers two huge lions along the path of the trail. He sits down in discouragement, ready to quit. Soon he notices the great doors of the Palace gate beginning to open. He notices that a beam of light runs the length of the trail and a voice from the inside calls him to come in. He starts to argue with the man inside and informs him that if he comes up the trail that the lions will devour him. The comforting reply returns back to him that if he will stay on the trail and walk in the light that the lions cannot reach him. The lions had heavy chains about their necks and the chains would not allow them to get on the trail to devour him. The character who opened the door and called out the instructions was the porter. He is symbolic of a pastor. How many times in the last forty years has Brother Harrell stood in that pulpit in Bridge City and his voice called out instructions and his actions sent a bold beam of light for folks to walk on? Not only did they make it past the lions but the darkness did not stop them. The goal was to get in the Palace Beautiful so they would be equipped to make it to the Celestial City. If we walk in the light, as He is in the light, we will not fall prey to the lions that Satan has at the sides of the trail. When Brother Harrell told me to get a grip on Pilgrim’s Progress, I started looking around for various commentaries on it. One of first ones that I found was a tattered, dog-eared copy of Alexander Whyte’s “Characters of Pilgrim’s Progress.” There are four volumes of Whyte’s musings but they are absolutely essential for one who wants to look a little deeper. I also found a Pilgrim’s Progress devotional written by Cheryl Ford that also was useful because of the summary that she did with characters and scenes. 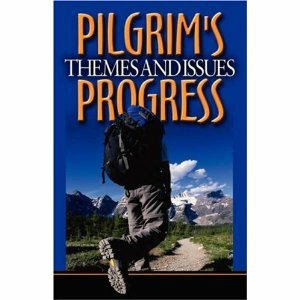 Additionally, I found a book by Barry E. Horner entitled Pilgrim’s Progress—Themes and Issues which is also loaded with thought provoking nuggets. I also found the updated version by L. Edward Hazelbaker published by Bridge Logos to be an excellent resource. As I mentioned yesterday about Brother Harrell reading Spurgeon, I also purchased MTP from Pilgrim Publications. It is a hefty investment but they still offer the same opportunity to subscribe and get books monthly or quarterly. 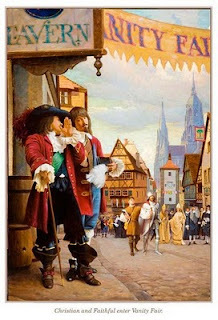 When I read Spurgeon and his interest in Pilgrim’s Progress, Spurgeon mentioned a number of Puritans that also used Bunyan’s allegory. Thomas Watson, Thomas Brooks, William Gurnall, and Jeremiah Burroughs all used illustrations that have helped me with preaching. So I commend these works to you although you will quickly find that the content is nothing like a lot of the lighter things that are selling today. Reading Spurgeon, the Puritans, and Bunyan is something you will have to grow into but it will transform and church and the next thing you know folks will be showing up to hear you preach! I have had several very positive e-mails from all over about Brother Harrell. Some have asked about how to get CD’s. The lady in charge of that is Paula Thompson and you can reach her at the church. The number is 409-735-5844. Sister Paula, as everyone calls her, has been doing the tape/CD ministry for a long time and can tell you more about Brother Harrell’s sermons than anyone, except Sister Harrell and Jahnette, Brother Harrell’s daughter. One of the most terrible things happened when Hurricane Rita blew threw a few years ago. Brother Harrell’s library and notes were shredded by the storm and every one of the cassettes at the church were lost. On a closing note, one of the funniest e-mails that I got was from one of the young men in the church. He said that one of the elders told him that he hoped he died before Brother Harrell retired. That is the kind of preaching I want to do in Dothan, I want to preach my way into these folks heart’s. It may take forty years to do but Brother Harrell’s example shows all of us that it can be done! More tomorrow. . . . Thanks for reading. . . . I am so happy that you write like you love my Pastor as much as I. Thanks for all the kind words. I told Sis Harrell sometime ago that we would have to build a handicap ramp for Bro. Harrell to go up in a wheel chair. He is not near ready for retirement, or rather we are not gonna let him go. I hope he is ready for another 40 yrs. One reason my husband and I do not go to all the conventions, is that we hear better preaching at home. And he loves us so much, he has us spoiled in a good way. We have known for 40 years that he is the best. He LIVES what he TEACHES. By far the best pastor/preacher in the world ! Considerate people ! I love them dearly !